If children are going to be scientist, they also need tools. Tools can help children see things they can’t see otherwise. Magnifying glasses are often provided, but I have found that they don’t provide much that a child can’t see by looking closer. On the other hand, a portable stereo microscope is fairly inexpensive and can be brought outside. Unlike compound microscopes, which require specimens to be mounted on slides, stereo microscopes allow the specimen to be simply placed under the lens. Worms and insects can crawl under. Pine cones, leaves, or any object under four inches in width can fit and the lenses can be focused on different parts of the object. Children can often see patterns on wings and leaves invisible to the naked eye. For younger children who may have a hard time looking into the microscope, you can hold a camera to one of the eyepieces and children can look at the camera’s screen. 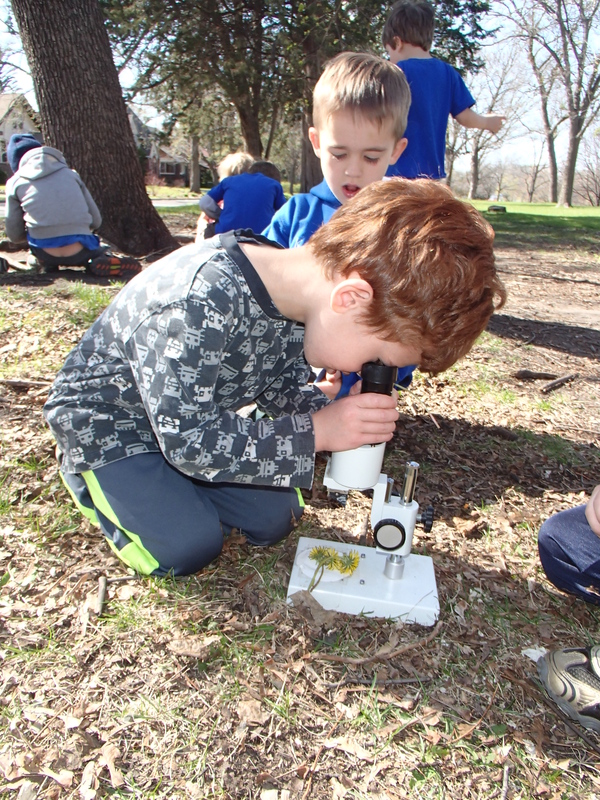 In my preschool classroom, one girl watched a worm move across the base of the microscope. She noticed the setae on the worm help it move across the base of the microscope. After watching it, she held the worm and felt it tickle her hand. She realized she was feeling the setae. She had felt this before, but looking in the microscope helped her notice it. Another way for them to “see what they can’t see” is to open up the object. 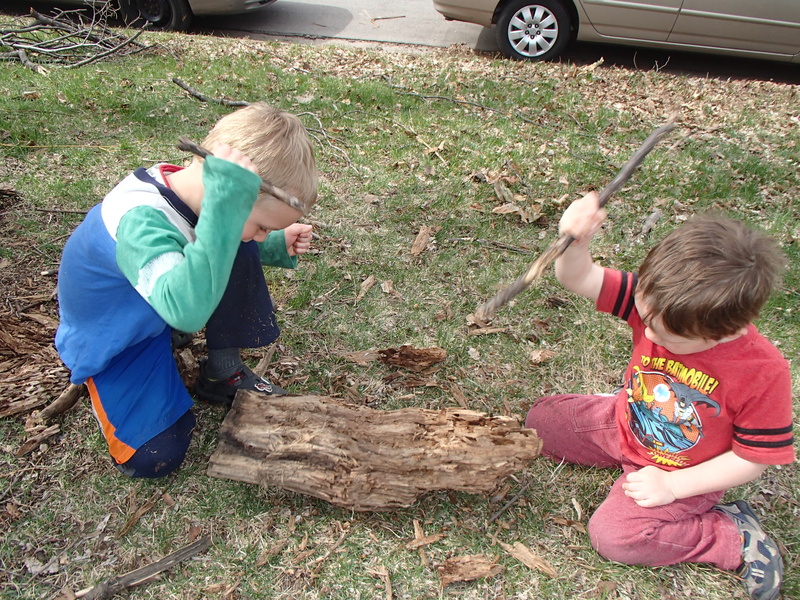 Hammers, knives and saws can be used by children over the age of three with adult supervision. Hammers can be used to crack nuts and other hard objects. Pumpkin carving knives can be used to open many firm vegetables. Depending on the size of the group and the abilities of the children, other knives could be used as well. An adult should hold the object unless it is big enough to stay still on its own. Saws can be used to open many other things. You need to clamp the object down so the children don’t have to hold the object while sawing. In general, preschoolers only pay attention to one thing at a time so they shouldn’t have to worry about steadying the object while cutting it. Several years ago I asked my class how a marker works. There were several theories, some more realistic than others. Then I clamped the marker to a workbench, and helped the children saw the marker open. Even the kids who had predicted accurately were amazed to see the color-filled cylinder. I have done the same with golf balls, soccer balls and a guitar (all broken). Many appliances or machines can be opened with screwdrivers. An adult should open it first to assess any risk of injury from sharp corners or moving parts. Adults may also find that there is very little for young children to see to understand how the machine works. While children can’t open up every appliance on a whim, they may look closer and machines they may have otherwise looked right past. 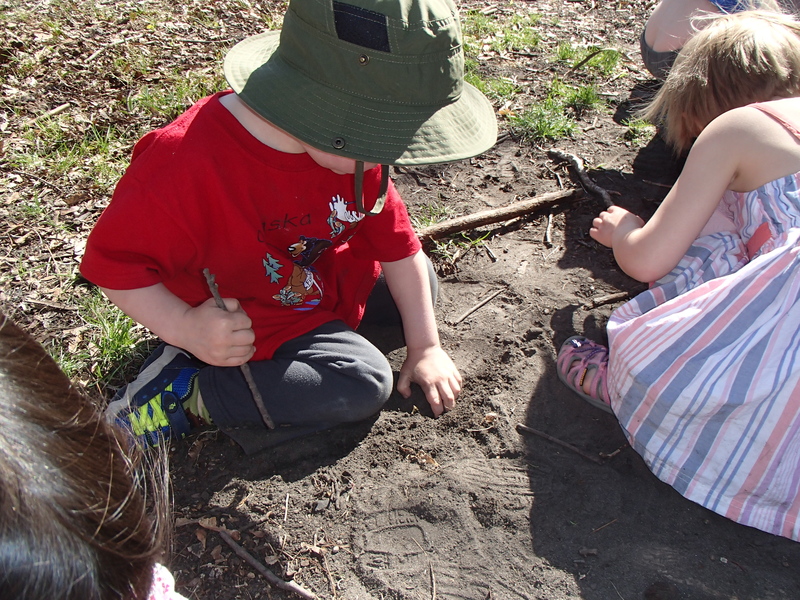 Giving children time and tools to explore the world around them, allows them to be the scientists researching the world around them. They are not just opening a walnut or a seedpod or a washing machine. They are opening a door to a new world. They are opening themselves up to wonder. Just as early childhood educators emphasize the process, not the product for art, we should also emphasize the journey, not the destination. 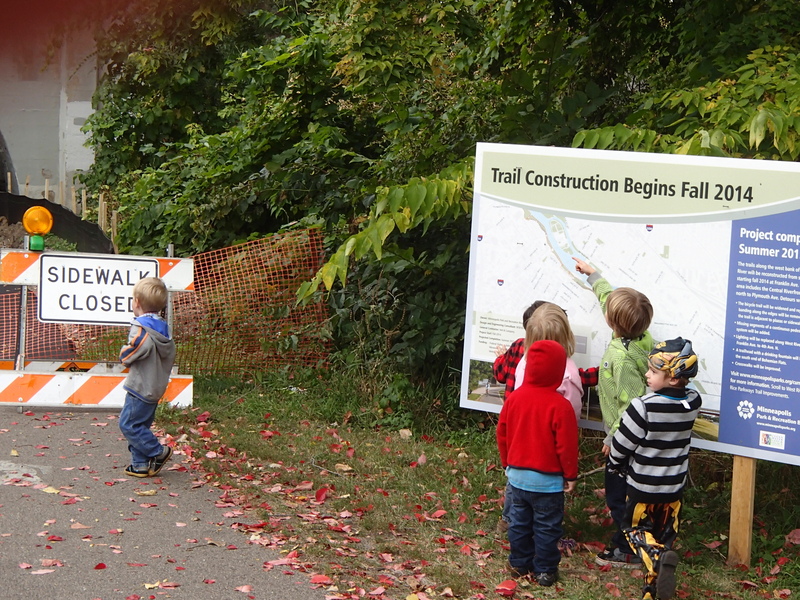 Too often teachers take children on walks outdoors to get to a certain place. Every effort is made to make that walk efficient. Children are often made to walk in a straight line or hold a rope. This can keep the children from stopping to look at things along the way, but that is exactly the problem. We should be encouraging children’s curiosity, not stifling it. 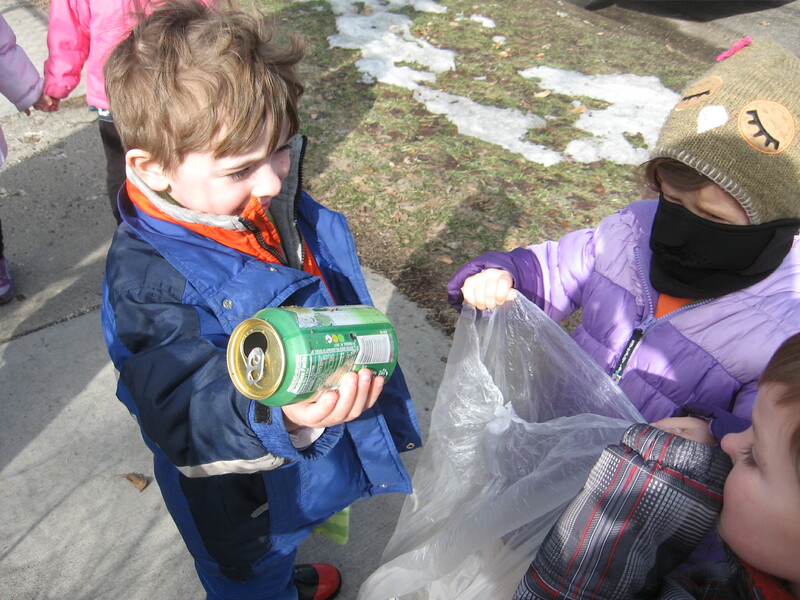 There is so much learning that can happen in the neighborhood. 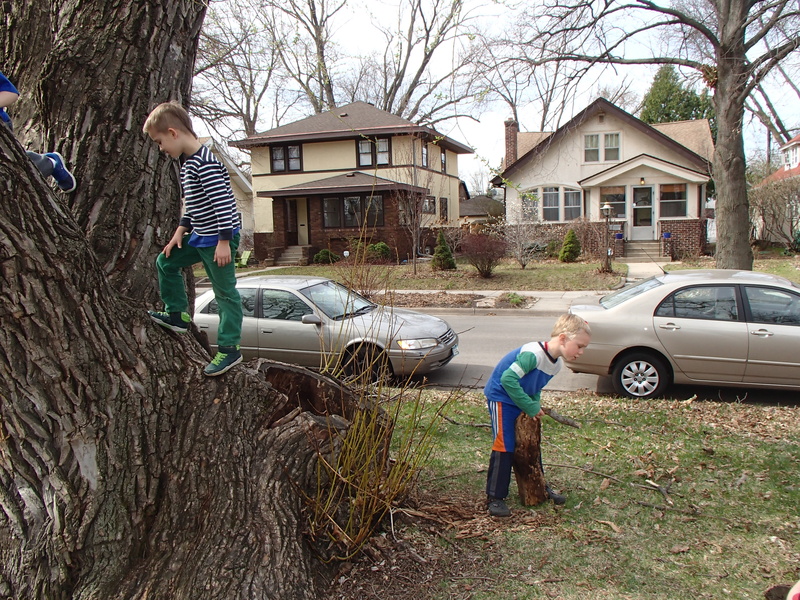 I think the neighborhood (or surrounding area) should be thought of as an extended classroom. Obviously the type of learning will depend on the setting. If the program is in the country, children can visit a special place. 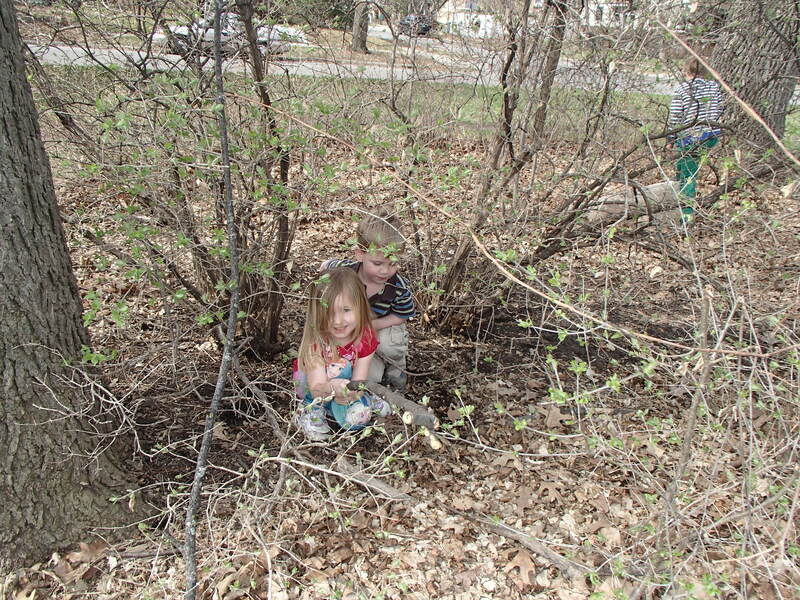 Each child could even adopt a tree that they check on regularly. 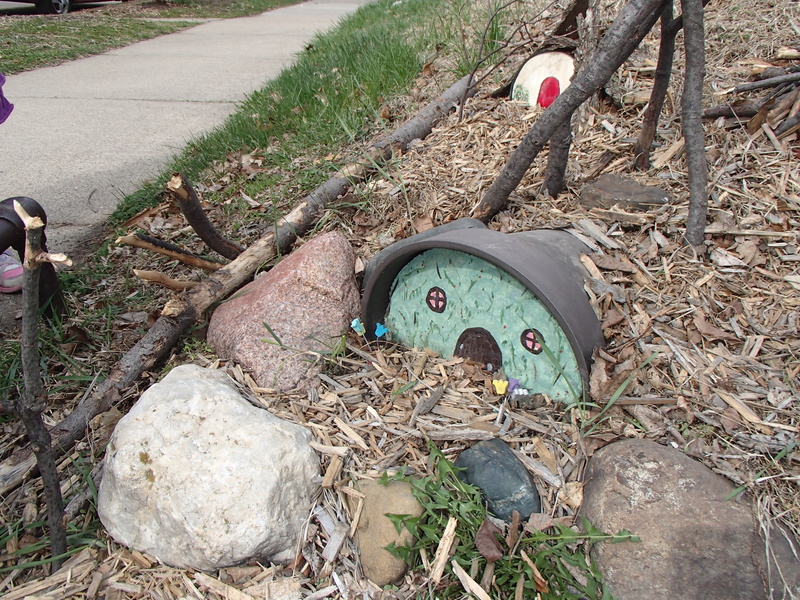 If the program is in the suburbs, the class might visit an elder (or a park or library). If there is construction nearby, visit regularly to watch the progress. In a dense urban environment, you might visit stores. My center is in an urban neighborhood. The neighborhood is mostly made up of single family homes with front and back yards. We are two blocks from the Mississippi River. 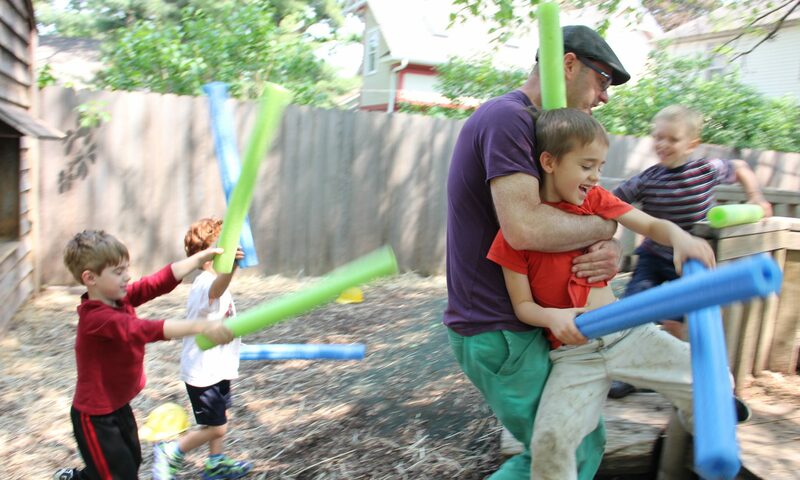 Since its inception over forty years ago as a parent cooperative, the center has been part of the neighborhood. One of the first teachers put it this way, “The neighborhood was the curriculum.” That is still true today (or at least it is part of the curriculum). play on without being near the roads. There are dozens of trees, which also means an endless supply of sticks, acorns, walnuts and so on. On our block, there is a neighbor with a small pond. We check on the pond throughout the year to watch the progress of the water plants, the fish and (later) the ice. We have a park we walk to that takes us under a highway overpass, which also has sloped concrete that presents a small challenge to children who try to walk on the incline to the park. We also visit a grocery store. Most importantly however, is our neighbor Barbara who has gardens lining the sidewalks on her corner lot. The gardens are full of flowers, but also lots of ornaments and objects. She has a whole section of gears from some ancient machine, another section with figurines of animals. the photos as well. Barbara used the photos (along with testimony from many neighbors) to win her appeal and her garden is still a magical place of discovery. In fact anywhere we walk can be a magical place of discovery if we just take the time to look. One of the ironies of writing a book about the need for kids to move around and play rough is that I am spending hours sitting and writing. Last week I spent an hour in a coffee shop writing about the dangers of sitting. I do move around during my day job, trying to keep up with ten four-year olds. But at night, I am often sitting down to write, or sitting down to watch something. Last Sunday, I was sitting down with my family watching a movie when my phone buzzed. There was a cryptic message from a friend. “Night games. 9:00 at the park.” It was from Julian. Julian is one of those rare souls who truly did not forget how to play. He is the founder of some of my favorite events here in the Twin Cities. One of those events is the Powderhorn Art Sled Rally where people are asked to decorate a sled and go down a hill at the end of January (often the coldest week of the year here in Minnesota so it can be -10F). 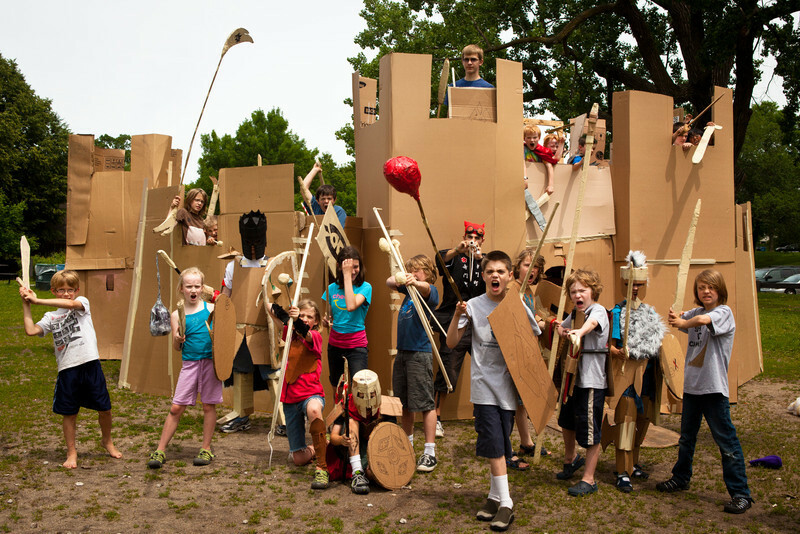 He also created the summer camp Adventures in Cardboard where children use cardboard to fashion armor, swords, shields and magical items. The kids spend a week creating shops to sell magical items, battle other houses (there are six houses, each with its own mythology), storm castles and wind their way through labyrinths. Needless to say, we were going. I grabbed our flashlights, my wife called a few friends, and my daughter grabbed her sword. We arrived at the park a little before 9. There was one other car in the parking lot. It was dark, but our friends had a flashlight. It’s an urban park, not necessarily dangerous, but people are mugged here on occasion when walking alone at night. It was definitely not my usual destination on a Sunday night. We heard others on the hill under a street light. We walked up to find Julian, his son and daughter and three other teenagers. We had three tweens and four adults with us. It was time to play. Julian pointed out the boundaries and explained the rules for “Manhunt.” The four teens were the hunters. The rest of us had to hide. They would try to find us and tag us out, but we could sneak up on them and tag the hunters out. Off we went into the darkness. As I ran off to hide, my heart started to race. It was dark and it was possible to hide in the trees, but as I saw four shadows approaching, a sense of fear gripped me. It wasn’t a paralyzing fear, but that sense of fear you get on a roller coaster. You know you are safe, and yet your instincts are telling you that your body should not be dropping at 40 miles per hour. It was the feeling I had as a child when I played “Ghost in the Graveyard,” “Bloody Murder” and other variations on Hide-and-Seek. This was much different than when I play chase with the preschoolers in my class. I have fun, but admittedly I am self-handicapping to keep the play going. Tonight I was trying my hardest and eventually running my fastest. It turns out I cannot outrun a teenager (I’m in my late 40s). All of us were trying our hardest and wavering between fear and elation. When we ran out of breath, we kept running anyways until we were tagged out. The 11 year olds, the teenagers, the adults, all were having a similar experience. The darkness helped equalize the experience a bit, and made it more exciting (and yes scary). It made me realize that this is what the preschoolers experience when I chase them. It’s not just that we are moving our bodies, there is also a sense of danger in a context of safety. Of course the kids could fall and scrape a knee, but they are not trying to outrun a wild animal. It’s a game and yet the emotions can react as if it were real. That is part of the play experience. And frankly, urban parks are often a place that can harbor fear, and yet a group of people can turn it into a place to play, and turn those fears into joy.